Thanks for paying us a visit here! Bronco Demo Team was formed in 2010 by a group of OV-10 Bronco enthusiasts. Our main goal is to maintain a living memory of this significant historic airplane and present the Bronco fully operational in its natural environment – flying through the sky – at airshows worldwide. Please do enjoy and explore what Bronco Demo Team is all about on this web space. We love to hear from you; do not hesitate to leave your comments. A calendar of upcoming events and airshow participations can be found here. Testimony over our successes and achievements can be found here. 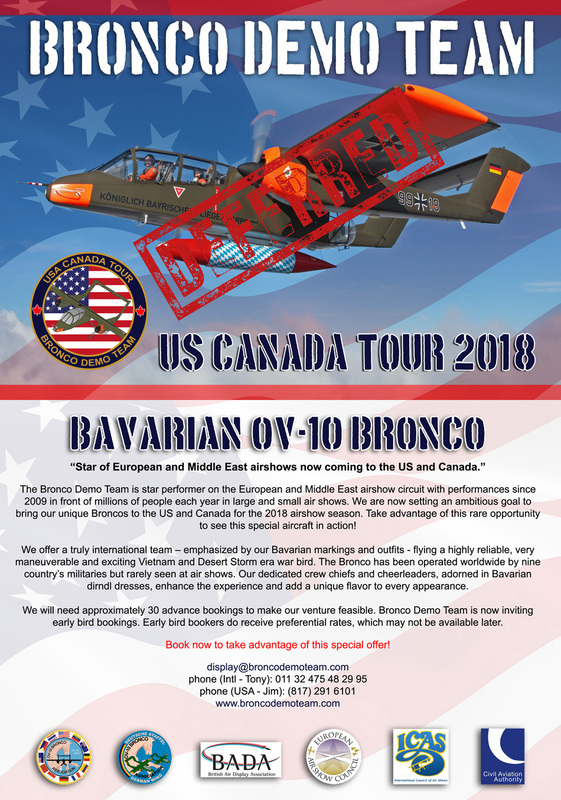 We are very excited, for this coming season the Bronco Demo Team will be bringing a Wild West themed OV-10 BUCKING BRONCO to airshows all over Europe. With the 2019 theme we want to put especially the very heart and soul of the OV-10 Bronco in the limelight. Back in the day when North American Aviation had to choose a name for their new NA-300 design, they did not have to think for long after the very sprightly flying characteristics became clear. They soon named the airplane ‘Bronco', after a wild or half-tamed horse of the western US. This year our Crew Chiefs will ride along as Cowboys and the Cheerleaders dressed as Cowgirls. The Ursel Avia event is always like a home-coming show, because we meet so many friends. The 2018 edition must have been the hottest of them all with temperatures rising to 30°C. The theme for this year was “aviation in movies”, and paying tribute to the well-known Sea King helicopters from Koksijde, that will retire soon. The line-up of aircraft was truly impressive, ranging from warbirds to helicopters and even an Airbus A321. The bi-annual Eurasia airshow is staged over 5 days. It is an aviation trade show in the sense of Le Bourget and Farnborough, located at the crossroads of Europe and Asia and attracts over 150.000 visitors to this important economic growth region. The show location, Antalya International airport, is also busy holiday hub with over 400 commercial flights a day. On Sunday March 25, the 7th Bronco Fan Day took place at our homebase Wevelgem Airport. The weather was more the perfect, a nice blue sky and a very enjoyable temperatures.For the first time a raffle took place to win a flight in the Bronco. 100 years Lübeck Airport, a homecoming show. Lübeck, a scenic town in northern Germany close to the Baltic sea, was the main base for the Rhein Flugzeugbau (RFB) target towing operation. In the beginning of the 1970s, their famous red painted Hawker Sea Fury T20’s were replaced by 18 OV-10B Broncos. The latter operated till 1990 before being offered to museums or technical schools. All our Broncos are ex-RFB machines, bringing this airshow appearance especially close to our hearts. In August we had the pleasure of being invited back to Biggin Hill for the second year in a row for their 100th Anniversary Airshow and Festival of Flight.This year the Biggin Hill Festival of Flight celebrating the airfields 100th anniversary, was planned over two days and we were able to arrive nice and early on Friday, and stay until Sunday to properly enjoy the festival and entire atmosphere. The Schaffen Oldtimer Fly-In is one of the oldest running aviation events in Belgium and took place for the 34th time. Located at the military airfield close to Diest, it takes place on the large grass plain mostly used for parachute jumping. It’s a very cosy event and Bronco Demo Team was happy to attend with both the Bronco and the Skyvan. Saturday 5 August the Lincolnshire Aviation Heritage Centre held their annual fundraising airshow. The former RAF East Kirkby a WWII bomber airfield is home to Lancaster NX611 “Just Jane”. A very fine example of the iconic bomber that is being restored to airworthy condition and will eventually become the second Lancaster flying in the UK. The 13th Malopolska Aerial Picnic organized by the Polish Aviation Museum and held at what remains of the now historical Kraków-Rakowice-Czyzyny airfield - one of the oldest military airfields in Europe - is a fondly cherished occasion. It was a great honor to be invited to display our Bronco here for the very first time and it proved to be a truly fantastic experience. The Royal International Air Tattoo was marked by the 70th Anniversary of the United States Air Force. But there was far more than the USAF theme with many aircraft converging on Fairford from across the globe. It was an honour to be part of this yearly event with both Bronco and Skyvan Demo Team. The first weekend of July Bronco Demo Team attended the Moorsele Fly-In. The small airfield is located near our homebase and takes just a couple of minutes in flight. That gave the opportunity to bring not only the Bronco but also the Marchetti. Sunday 11th June saw Bronco Demo Team participate in two airshows in the UK. The first display was at the Bob Jones Memorial Airshow which is staged at Welshpool airport by the Welshpool Town Council with support of Welshpool Airport. The second display was at the annual RAF Cosford airshow itself, where our OV-10 Bronco took part in a staged Vietnam war set-piece. Organized every two years by airfield owner and warbird enthusiast Tom van der Meulen and supported by an incredible team of helpers and volunteers, the Oostwold airshow has now firmly established itself as the foremost warbird airshow in Holland. A busy weekend opening our 2017 airshow tour of Europe started in Duxford, legendary for its warbird collections and the Imperial War Museum. Weather was fantastic with blue skies and really hot temperatures. The weekend of 18-19 March, our 2017 season started with the Bronco Crew Chief training weekend and on Sunday the 6th edition of the Bronco Fan Day. On the evening of 18 March, the newest edition of “Rate One” magazine was officially presented featuring the Bronco on the cover. For the occasion an exclusive night photo shoot was organized in cooperation with Bronco Demo Team, Rate One and Salens Motors. The people of Aerosoft created a high-detailed OV-10 Bronco addon for Microsoft® Flight Simulator, “BRONCO X”. Thanks to the great work by Frank Felix we can now present you the special Bronco Demo Team 2017 Poppy theme textures. A very first participation at a North American regional airshow convention for Bronco Demo Team, represented by pilot Tony and his wife Edith. In December of last year, the Bronco Demo Team made its North American debut at the premiere air show venue of the International Council of Air Show’s annual convention in Las Vegas, Nevada. On Wednesday 15 February 2017 Bronco Demo Team’s OV-10 Bronco G-ONAA undertook an extensive tour of the WWI battle fields around Ypres overflying many of the memorials and cemeteries that lay as silent witnesses to the atrocities inflicted a century ago. For the sixth time Bronco Demo Team was invited to the Royal International Air Tattoo at RAF Fairford. RIAT is known to be the largest military airshow worldwide. Bronco Demo Team was present in the static display with Bronco and Skyvan. Bronco Demo Team was invited to provide a flying display at Cleethorpes with the Bronco on Sunday afternoon 26th June for the Armed Forces Day. The weekend of 2-3 july was a very busy and exciting weekend, as both Bronco and Skyvan Demo Team were present, for the second year in row, at the Yeovilton Air Day. Both reports are now online, enjoy! After a great weekend in the Netherlands the Bronco Demo Team headed, with 99+18 and the Skyvan, towards Denmark to make its first appearance at the Danish Air Show, which took place on Sunday June 19th 2016 at Fighter Wing Skrydstrup. Every two years the Dutch Air Force organizes the “Luchtmachtdagen” (Air Force Days). The event alternates between the major bases in Holland and this year the location was Leeuwarden AB in the province of Friesland. An excellent line-up of display aircraft and teams are always the order of the day on the Luchtmachtdagen. It was a great pleasure being invited to the Biggin Hill Festival of Flight, at the most famous and historic of airfields in the UK.The organisers had a well matched display of various aircraft from the old Warbird’s through to the Catalina and the Red Arrows. Tony completed his display very professionally just as the rain started to dampen everyone’s spirits and enjoyed his display there. The Imperial war Museum at Duxford is well known as a main center for warbirds in Europe and is famous for it’s superb airshows. The first show of the year always carries the special theme honoring the close ties of Britain with America. We were very excited to participate in this show and were asked put up a duo-display with the Skyvan and Bronco. In keeping with the tradition, the opening airshow of the season is the Abingdon Air & Country show. This year the event took place on May 1st and for many people it was their first airshow outing after a long lazy winter. Despite the major changes in safety regulations following the Shoreham accident, Neil Porter and his volunteer team put together a great line-up of aircraft in combination with a large fancy fair. On Saturday April 30th, the third edition of the UK Bronco Fan Day took place at Cotswold Airport. After the great success of the previous editions, the tradition was kept, bringing Bronco friends together during this cozy event. The weather turned out pretty good with sunshine and some fluffy clouds, which made many people to come over and have a closer look at the Bronco. At the beginning of each airshow season, Bronco Demo Team members come together to review the past season and looking forward to the new. This year Bronco Crew Chief Training Weekend was organized on March 19-20 and - in keeping with the tradition - the the 5th edition of the Bronco Fan Day was laid on on Sunday. The Al Ain Air Championship is a three-day aerobatic style championship. Eight to ten invited aerobatic teams from various countries around the world - including military flying aces and civilian daredevils - square off to impress the judges, win the hearts of fans and are crowned Grand Champion of the skies of Al Ain. Bronco Demo Team was honored to be one of the teams to participate in the 11th Championship. One of the most famous and longest lasting Airshows in Europe is the Sanicole Airshow in Belgium. It was with great pleasure we participated this great show, both with the Skyvan and the Bronco. A late reshuffle of our display commitments saw us visiting the friendly fly-in at Zoersel for the second year in a row, courtesy the Aero-Para Club der Kempen.The weather was favorable and an excellent time was had amongst many friends in a most relaxing way. Last year we visited this friendly fly-in with the Bronco, our visit then being curtailed by the incoming weather. Luck was on out side this year weatherwise, but nevertheless we decided to take our own proper caravan with us in the form of Skyvan G-BEOL. A beautiful warm sunny day saw an estimated 70,000 people on the sea front enjoying barbeques, Pimms, and picnics. The Bronco was a late addition to the airshow and was well received by the crowd. The Royal Naval Air Station of Culdrose, located in Cornwall is one of the most beautiful locations to organize an Airshow. We were happy to attend the Culdrose Air Day with both the Bronco and the Skyvan. The location and the brilliant weather made for some very nice photographs, enjoy the report! A transit between two airshows at the extremes of the British Isles, one on the East Coast – the Sunderland International Airshow – and the other one in the far South – the RNAS Culdrose Air Day -, provided an ideal opportunity for an stunning flight through low flying areas of the Lake District and Wales. Check out the stunning images and an in-cockpit movie! The Sunderland Airshow is the biggest free annual airshow in Europe, held between Roker and Seaburn seafronts. This year the show was held between Friday 24th July and Sunday 26th. Bronco Demo Team gratefully accepted an invitation to the Royal International Air Tatto (RIAT) at Fairford, with not only the Bronco but with in addition two company Short Skyvan aircraft. The arrival on July 16th appropriately marked the first flight of the OV10 Bronco 50 years earlier with an arrival at approximately the same time the wheels of a Bronco first ever left the earth. Wednesday November 25, 2015 saw OV-10B Bronco “99+26” taking to the skies again for a first postrestoration flight from Duxford. The airplane was ferried to Bronco Demo Team's homebase at Kortrijk-Wevelgem in Belgium. July 16th was a very special date for Bronco Demo Team, as this year it marked the 50th anniversary of the first flight of the OV-10 Bronco. To celebrate this, a very special formation took to the sky and flew to the biggest military airshow in the world, the RIAT at Fairford. Skyvan Demo Team took part in the Yeovilton Air Day for some very special missions. Not only gracing the static display, but also getting the parachute team airbourne and performing some photoshoots with the French Navy and the unique V-formation! Skyvan Demo Team was invited to the Manchester airshow 2015 for it’s first ever public flying display on July 5th. An interesting and varied flying display had been arranged for by the enthusiastic team at City Airport. The Skyvan fitted in nicely as one of the bigger aircraft to still operate from the airfield’s relatively short runways. The second edition of the Koksijde Fly-In took place during the first weekend of July. Located close to the Belgian coast, it’s a nice venue to visit, both for crew and public. Both the Bronco and a Skyvan were present for a static display over the weekend. In June, a Fly-In was organized at the Moorsele Airfield in Belgium, in tribute to Roland Nuytten. For the occasion the Skyvan was transformed into a Party Van. Curious about the result, then check out the photoreport. Bronco Demo Team was invited for a return visit to the bi-annual Memorial Airshow at Roudnice nad Labem in the Czech Republic. Located close to the capital of Prague, the local Aeroclub organized the event for the 13th time, and a record crowd of 50.000 people visited the show during the weekend! The Weston Air Festival is a seaside event which started many years ago as a helicopter specific event, but has in the meantime grown to a full blown airshow with great allure, attracting over 300.000 people over two days. Mid June, Bronco Demo Team visited Poland for the very First time to visit the first edition of the AEROfestival at Poznan. The long trip was rewarded with great weather and fantastic hospitality. The 25th edition of the Antwerp Stampe Fly-in was a big success. During the weekend a lot of nice aircraft attended and a record number of people visited the event. We had a great time again meeting many of our friends. For the second weekend in a row, Bronco Demo Team visited the neighbouring Netherlands. This time for ‘Volkel in de Wolken’, the largest civil airshow in the Benelux. It’s not only an airshow, there’s also a fun fair, classic cars and other festive activities, all in a perfect setting. During the Pentecost weekend, the 8th edition of the Oostwold Airshow took place. Located close to Groningen in The Netherlands, the organizers brought a nice variety of aircraft to their show, including many warbirds. Great people and great weather made a fantastic weekend! For the last 5 years the Abingdon Air and Country Fayre has been on the agenda of Bronco Demo Team. Despite the less favorable weather, the organisation did a great job to give the attending visitors a great day out. As a starter of our 2015 Airshow season in the UK, the team came over to Kemble for the second edition of the UK Bronco Fan Day, in cooperation with the Cotswold Airport, the Bristol Britannia XM496 Preservation Society and Fly2Help. As winter is set to close and spring moves in, with another airshow season to start soon, it was also time to open the hangar doors at our homebase to let the Bronco fans see Bronco 99+18 in her new colors. The 4th edition of the Bronco Fan Day was again a great succes, thanks to all our great fans who support us during the past 5 years. Two weeks ago, Bronco Demo Team? visited the European Airshow Convention at Antwerp. The EAC promotes excellence and safety at Airshows and the yearly convention is the main meeting point of all involved in the Airshow scene in Europe and even beyond.The Convention was a very good start of the season with many good contacts made, no doubt leading up to a most promising season. The last event of the 2014 season brought Bronco Demo Team to RAF Northolt for the night photoshoot. This event gives great opportunities to Aviation Photographers who can photograph the attending aircraft in a very special way. So have a look at the report, which include many great shots. On the weekend of September 27-28, Bronco Demo Team was invited for the private Fly-In at the Lille-Bondues airfield. This historical airfield is only a 3 minutes hop from our homebase, just on the other side of the Belgian-French border. Bronco Demo Team was happy to attend the Belgian Air force Days at Kleine-Brogel during the weekend from the 13th of September last year. With over 100.000 visitors attending, this was one of the bigger events we've been invited to in 2014! As always it was nice catching up with our many Bronco fans and friends!! Talking to aviation enthusiasts and other crew members, making new friends and enjoying the scene is what Bronco Demo Team enjoys most! The furthest airshow in distance from our homebase in 2014 was Air Waves 2014 in Portrush, Northern Ireland. Portrush is a small coast town located on an elevated rock projecting in to the north Atlantic Ocean and hence provides a great vantage point for any airshow goer with excellent photo opportunities.